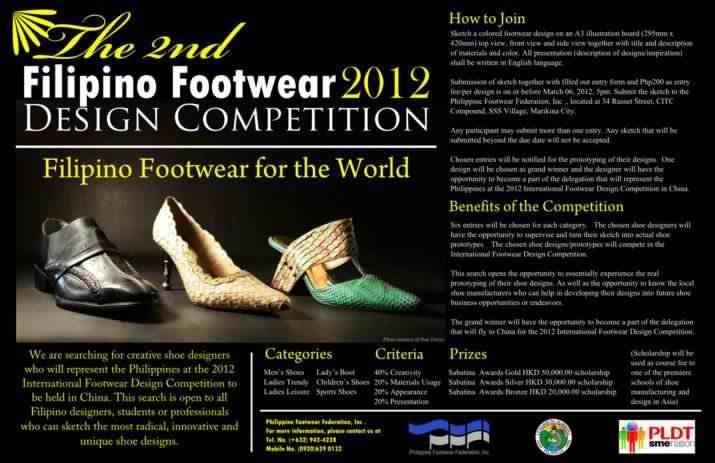 The Philippine Footwear Federation, Inc. (PFFI) is hosting its second local shoe design competition. Titled “The 2nd Filipino Footwear Design Competition 2012: Filipino Footwear for the World,” this offers would-be footwear designers the chance to turn their unique designs/creations into a real extraordinary fashionable shoes. The PFFI, in behalf of the entire footwear industry, hopes to encourage fresh concepts and to discover new local talents in designing shoes for the local and international market. "The 2nd Filipino Footwear Design Competition: Filipino Footwear for the World 2012"
Sketch a colored footwear design on an A3 illustration board (295mm x 420mm) top view, front view and side view together with title and description of materials and color. All presentation (description of designs/inspiration) shall be written in English. Submission of sketch together with filled out entry form and Php200 as entry fee/per design is on or before March 09, 2012, 5pm. Submit the sketch to the Philippine Footwear Federation, Inc ., located at 34 Russet Street, CITC Compound, SSS Village, Marikina City. Any participant may submit more than one entry. Any sketch that will be submitted beyond the due date will not be accepted. Chosen entries will be notified for the prototyping of their designs. One design will be chosen as grand winner and the designer will have the opportunity to be part of the delegate who will represent the Philippines at the 2012 International Footwear Design Competition in China. Six entries will be chosen for each category. Chosen shoe designers will have the opportunity to supervise and turn their sketch into actual prototype shoes. The chosen shoe designs/prototypes will compete in the International Footwear Design Competition. This search opens the opportunity to essentially experience the real prototyping of their shoe designs. As well as the opportunity to know the local shoe manufacturers who can help in developing their designs into future shoe business opportunities or endeavors. The grand winner will have the opportunity to be part of the delegate who will represent the Philippines in the 2012 International Footwear Design Competition in Dongguan, China.